Austria. Salzburg. Matthaus Lang von Wellenburg, AD 1521. Silver Batzen. Denomination : Silver Batzen. Mint : Salzburg. Size : 24.4 x 25.1 mm. Weight : 3.09 grams. Grade : XF for wear (some lustre remaining), but some areas of weakness so can conly be graded gVF. A very nice example of one of these (they are seldom seen without some weak areas). 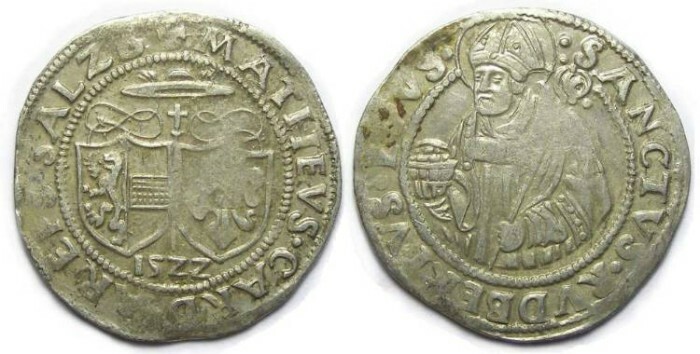 Obverse : Arms, with the date 1522 below, and MATHEVS CARD AREPVS SALZB around. Reverse : Saint Rupert shown from the waist up, with SANCTVS RVDBERTVS EPVS around.